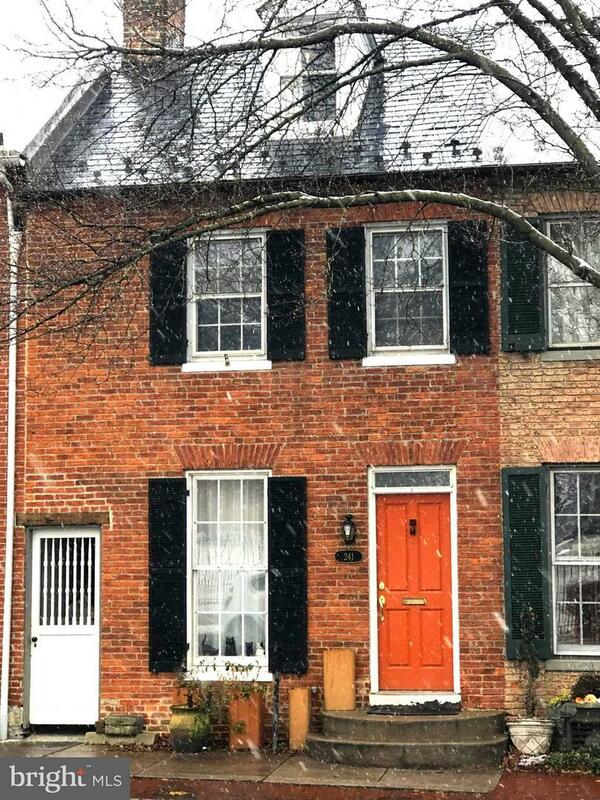 Historic home with deeded private parking, 2-zone central air with roomy elevator that reaches from 3rd story to basement, making it very easy to carry items to all levels in the home. 3 spacious decks. Duvinage spiral stairs for exterior access from backyard to 2nd story porch. Lush mature yard. Wood floors plus 2 non-working fireplaces, exposed brick in some rooms. 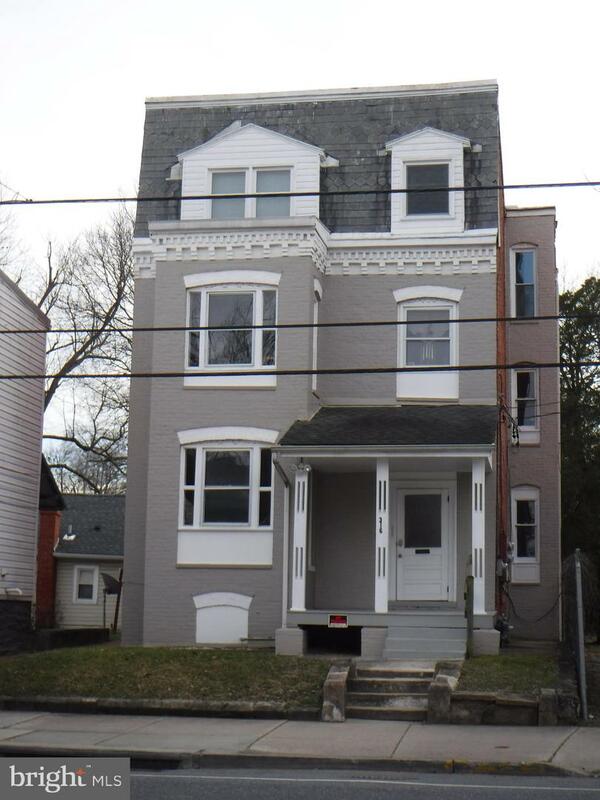 3 Bedrooms with 3 Full baths. Master Bath has walk-in shower and heated floor Bath is main level next to guest room also has heated floor with walk in shower. Basement has 1/2 bath, and cemented floor. 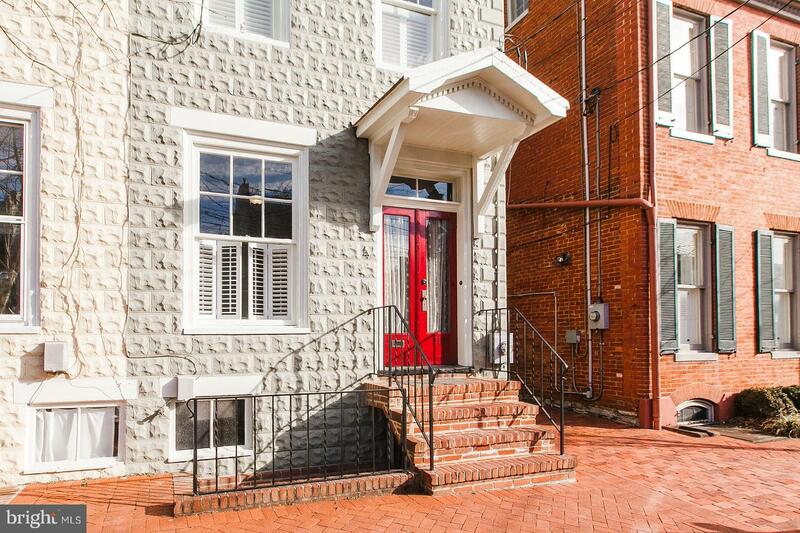 Comfortable and easy to live in, with its great location in the Historic District, its parking area makes it very convenient. A block away from restaurants and specialty shops. 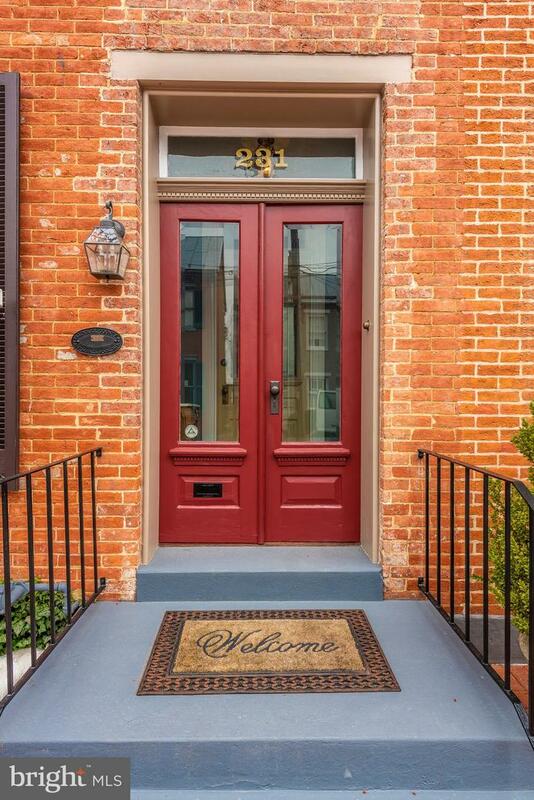 Listed by Beatriz C Smith of Long & Foster Real Estate, Inc.
"Historic Downtown Frederick Rowhome." 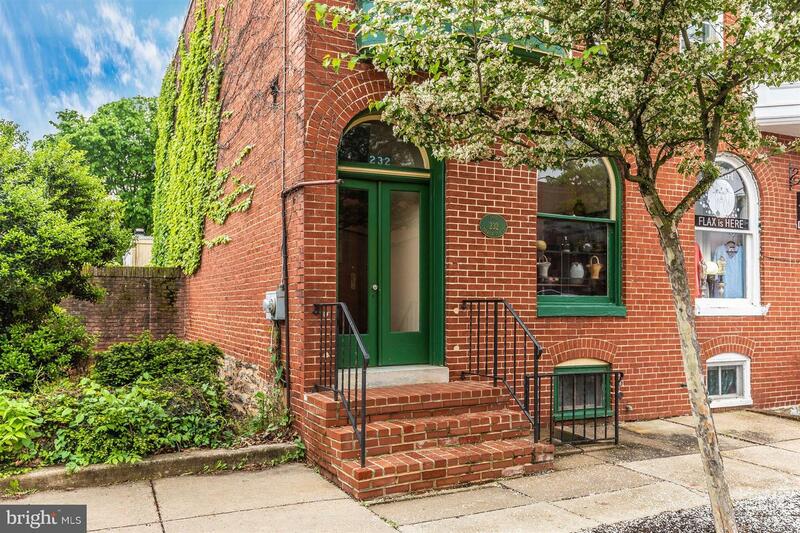 Enjoy a piece of history with this 1853 home on Hallertown Hill. Built across from the Old Frederick Fairgrounds (and now the Maryland School for the Deaf), it was the original home of Tobias Haller and remained in the Haller family for over 100 years. Lovingly restored to retain the character of the old (original heart pine floors, plaster walls/ceilings, detailed door/ window trim, ~wavy~ glass, summer kitchen with exposed brick, wood burning fireplaces in living room and master bedroom) while incorporating the convenience of the new (upgraded electrical, plumbing, faux slate roof, heating/air conditioning without the huge and intrusive ductwork), hydronic heat in the summer kitchen brick floor, full height basement with cement floor). Kitchen has custom cabinetry with a soapstone sink and counter and with minimal built-ins allowing for easy re-styling according to your taste or needs. This charming home is situated on a very deep lot with lots of flowers and a 2-car garage at the rear. Potential for additional bath exists on main level, or lower level, which has a rough in for a bath. 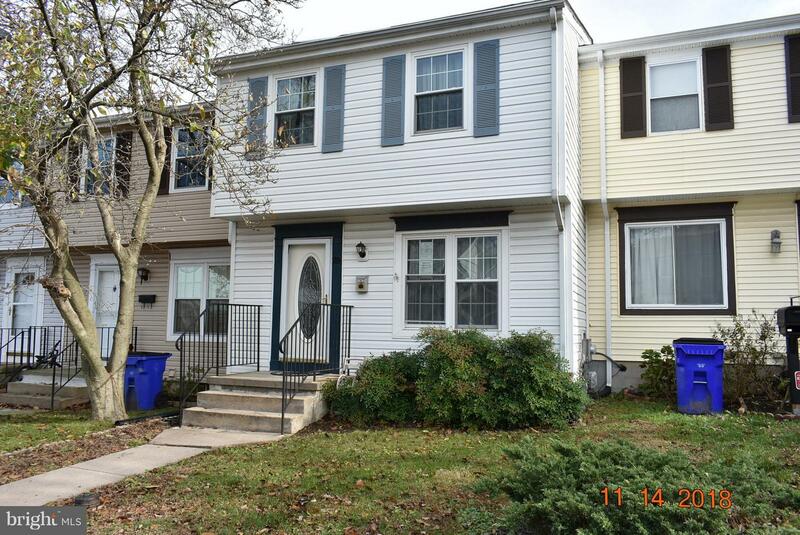 Seller will consider $5000 allowance for possible 1st floor powder room* Within walking distance of the historic city center, Baker Park, Frederick Keys baseball stadium, Weinberg Center and Carroll Creek, it~s the perfect location to walk to the many activities that make Frederick special. HOME WARRANTY!! Affordable interior unit Townhome. Slider on lower level to partially fenced yard. Interior needs some minor TLC. 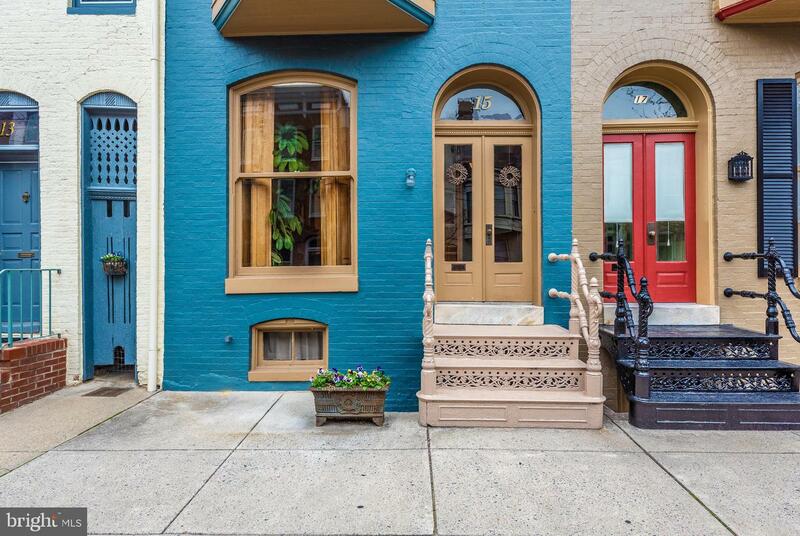 Live,work,play in this extraordinary turn of the century home adjacent to the carroll creek linear park. Unique and desirable features include: **vintage appeal with many creative touches **exposed brick interior walls **handmade pottery sinks **beautiful wood floors throughout **front parlor with pocket doors - a lovely space for an office, study or library **large, bright contemporary family room adjoining the updated kitchen **private deck off family room **hidden surprise beneath the deck - a generous sized room that may serve as a studio, workshop or wine cellar **spiral staircase to garden path that ends at the historic districts crown jewel, the carroll creek linear park! Here you can enjoy concerts, view exhibits, dine out, go for a stroll. The good life all in one place!! **this property is zoned db so you may have both a residence and a business here, if you so desire.